I don’t know about you, but I’ve slowly started realizing that the plastic dishes and containers I have in my kitchen might not be healthy for me to have around. At all. Take, for instance, the recent uproar about Bisphenal A (BPA), a chemical that’s commonly found in plastics and canned foods (in canned foods, the BPA is the white coating on the inside of the can). In this article on Medicine.net, they report that a recent study found traces of BPA in the urine of 93% of the people tested. Another article from a news service in South Carolina interviewed Dr. Cynthia Lee of Clemson University, who says that low concentrations of BPA can increase the risk for prostate and breast cancer. Not good. This article by USA Today says that those with the highest levels of BPA in their systems were twice as likely to have heart disease or diabetes. Yikes. This is why more and more people are trying to eliminate plastics from their kitchen. Sound impossible? It’s not really. Switching to glass and stainless steel is your best option. In light of the increased awareness on the dangers of plastic, the folks over at HealthyKitchenware.com just sent me this great product to review. Their mission is to help reduce or eliminate the plastics from our kitchen, and every product they carry is not only eco-friendly, but it’s human-body friendly. 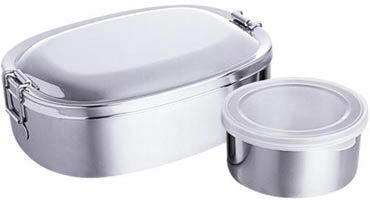 The product they sent over for me to check out is their Stainless Steel Lunch Carrier. The first thing that struck me about this eco-friendly lunch carrier is how cool it looks. It’s like a little army mess-tin. You just want to throw it into a backpack and head off into the wilderness to have lunch. The second thing that struck me was how tight the lid is. The two little latches on the side keep it in place and, barring an explosion, it’s not coming off. If you’ve ever opened your lunch bag and groaned because the plastic lid came off and your lasagna is all over the place, those days are over with this little baby. Now, the main container does not have a water-tight seal. I filled with with water and it leaked slowly. But anything thicker than water, like pasta sauce, is definitely not coming out. The lunch carrier also comes with a neat little container for things like soy sauce or dressing. The smaller container does have a plastic lid (#5 polypropylene, which means no BPA), but your food really won’t be touching it so it’s not a big deal. The smaller container is water tight, so this is where your liquids need to go. The lunch carrier measures 6.4 inches long, 4.9 inches wide, and 2.3 inches deep. It’s not huge, but unless you’re taking a Hungry Man Meal for your lunch you’ll have plenty of room for things like pasta, salad, or sushi. My vote? 5 out of 5 stars. I’ll definitely be using this little lunch carrier on my next picnic. It’s cool to look out and healthy too, and there’s nothing I didn’t like about it. All of the product reviews on TheGreeestDollar.com are unbiased. I do not receive any compensation, financial or otherwise, for promoting anything on the site. Some products are sent to me directly from vendors. Others I buy and use in my own life. Good or bad, the opinions expressed in my review is solely that: an opinion.